Do you like cars? No, do you really like cars? Classic cars? Hot rods, muscle cars, drag racers, and street racers? That car from Smokey and the Bandit? You know the one. You don’t just like cars, you love cars. It’s a passion. A burning passion. Well, we’ve got a burning passion for cars as well. And that’s why we’re Burning Up the Beaches in Destin, Fort Walton Beach, Okaloosa Island – the Heart of Florida’s Emerald Coast. 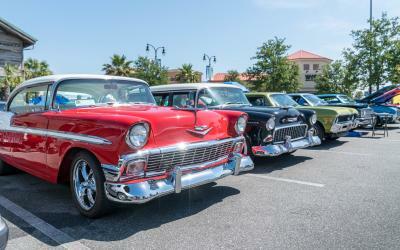 No other car show on the circuit combines fun and value like Burning Up the Beaches. Located in Destin Commons, the premier shopping district of Destin, FL, this beloved car show is surrounded by a variety of shops and restaurants, including Bass Pro, Uncle Bucks Fish Bowl, H&M, World of Beer, and more. With classic cars from the 40s to brand new vehicles featuring the latest in modern designs, you’ll need every minute of this three-day event to see all the beautiful vehicles on display. Unlike other car shows charging you $30 for just one day and a measly t-shirt, we give you more for your money. Get two armbands (for two people), and enjoy three parties with live music, five fantastic stops, dinner on Saturday night, prizes galore, an event decal, one fabulously designed t-shirt, and of course all the fun of the car show for only $80. And, as if this wasn’t enough, because all Burning Up the Beaches net funds go to The Arc of the Emerald Coast – the local ARC Agency serving those with Down Syndrome, Cerebral Palsy, Autism, and other developmental disabilities – your purchase of armbands is considered tax deductible. While we know you’ll come for the car show, we hope you’ll do yourself a favor and stay a bit longer to experience all the area has to offer. You can’t burn up the beaches without seeing the beaches. Iconic sugar-white sand and glistening emerald-green waters combine in Destin, Fort Walton Beach, Okaloosa Island to create some of the world’s most sought-after and relaxing beaches. However, we’re more than entertaining car shows and gorgeous beaches. Explore our untouched, unspoiled, and sometimes unbelievable outdoors with fishing adventures, nature preserves, paddleboards,golf,motor boats, and much more. Plus, if you’re ready to take a break from outside fun, you’ll love our mouthwatering waterfront restaurants, captivating museums, interactive aquarium, and vast array of accommodations on and off the beach.